Home ›› Retail Insights ›› Can online grocery retailing be profitable? Can online grocery retailing be profitable? There are many studies and consultant opinions detailing the demise of bricks and mortar retailing. The rise of e-commerce-only companies like Amazon, Alibaba, ASOS and Ocado are testament to the threat that the traditional retail business is faced with. But the growth of e-commerce grocery retailing, whilst undoubtedly popular with consumers, is currently unclear as to its financial sustainability. At FRC we explain why, especially in the grocery area, this branch of the internet revolution is yet to prove its worth! There are several factors playing a role when comparing bricks and mortar and pure online retailers (called “pure players” further on). Grocery retailing is fundamentally a low margin business. Depending on the format or how developed the market is, EBITDA margins generally range from 4 to 8% and EBIT runs between 2 and 5% of net sales. Returns on capital employed (ROI) ranges from 7 to 12%. The attractiveness of this tough business is the absolute cash profit possible. This makes grocery retailing one of the highest cash generators of all forms of business. In a low margin industry, costs are key to ensuring prices are acceptable for the consumer and here’s the big deal: costs for running an e-commerce operation are NOT lower than the bricks and mortar equivalent! See exhibit 1 below. 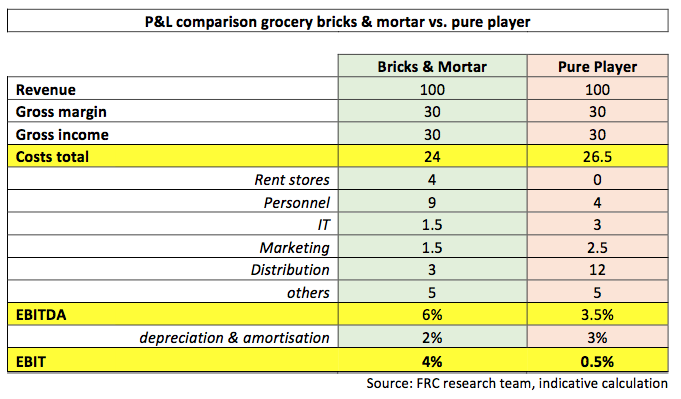 Pure player grocery operators have much higher depreciation and amortisation due to the relatively high investments necessary in technology, robotics and logistics equipment. Ocado in the UK is an interesting case study. It performs slightly better than the average pure player business indicated in exhibit 1. After 16 years in business, Ocado, with £1.3b of sales, 230,000 orders handled every week and, what is accepted as world class back office systems, produces an EBITDA profit of 6% and an EBIT of 2% – still considerably less than a bricks and mortar business of a similar size! Additionally, gaining more sales and volume for a pure player does not always fractionalise the costs in the same way and therefore does not increase profits proportionally as it does for bricks and mortar grocers. Whereas a physical store creates significantly more profits with increasing revenue, an e-commerce grocery retailer gains less. As shown in exhibit 2, the pure player is confronted with higher variable costs. The more customers that a pure player gains, the more costs it has, as its distribution expenditure is a larger proportion of the total costs than its’ bricks and mortar equivalent. The position could look a bit better for any pure player, if any gain in revenue was achieved by increasing the value of an online basket. Then a part of the distribution cost could be fixed. However, when we look at a business such as Ocado, the basket size is already more than 4 times a typical bricks and mortar equivalent. The reality is likely to be the opposite when trying to access a broader number of customers and the average basket size is more likely to fall towards the bricks and mortar figure (see exhibit 3). As an additional factor, the category mix of an online basket is different (actually more profitable) from the bricks and mortar equivalent. Lower margin categories like fruits & vegetables and meat are less prominent in an e-commerce basket, as the consumer trusts someone else less that they can pick the exact items they would choose for themselves in these product ranges. Whilst higher margin categories like heavy, bulky washing powders or beverages are overrepresented, and this helps the average basket to be more profitable. Furthermore, non-food business such as textiles, homeware, stationery, etc. 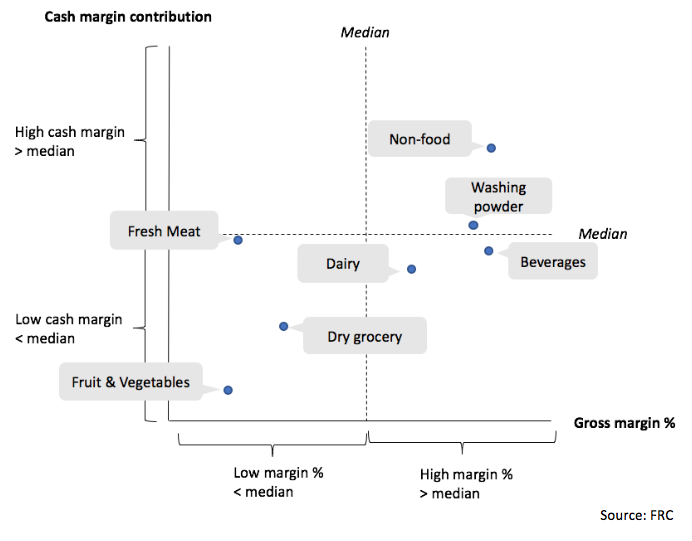 tend to be higher margin and often high value items, so grocery retailers that can offer to mix in these ranges from their hypermarket business can increase their profitability (see chart 4). Tesco’s online business is more profitable than most UK grocery competitors as it targets to sell a significant share of its non-food higher margin ranges. To overcome the lack of profitability for a pure online grocery player, a paid for delivery service is necessary. We at FRC are not suggesting grocery e-commerce will never work. But we are suggesting that the only way to create a sustainable profitable model in the developed retail markets is to charge a fee for the extra service. We estimate this fee has to be at around 4% of a typical £80 basket. This is quite different from adding 4% to all the e-commerce retail prices which has proved to irritate consumers who compare prices with a bricks and mortar equivalent and don’t want to pay more. Adding 4% on to the bill by way of a delivery charge will however shrink the number of consumers to those who value their time more preciously. This is why it has been so difficult for most retailers to get mass consumer acceptance for paying this additional cost. We have conducted research of the UK online grocery sector to illustrate that point, shown in exhibit 5 below. Only Tesco is likely to be as equally profitable as their bricks and mortar business, as they charge more than 4% for the delivery service. Online grocery share is predicted to grow from 4% to 9% in Europe by 2025, our view at FRC is that is overly optimistic. Overall market growth is forecasted at just 1% per year. The increasing level of competition to chase this tiny market growth is likely to create a more competitive environment and therefore a profit pool shrink. In turn, in an industry where profits are harder to come by, channels like e-commerce cannot be aggressively targeted without compensatory delivery charges making it worthwhile, and this will slow the rate of growth for this channel. Furthermore, as delivery charges of 4% of the basket amount are forced to become the norm, we at FRC believe that “click and collect” will replace some of the full delivery service business (here the consumer collects their pre-picked shopping at their leisure from a pre-agreed location). It is the delivery, rather than the picking of the consumers’ shopping basket that is the most expensive part, so it would require a much lower fee. However, this is very difficult for a pure player retailer to do, as it will have to contract locations for pickup, and of course there is a cost to this as well. A bricks and mortar player could more easily integrate a “click and collect” service in existing stores in locations convenient for the customer. We at Foley Retail Consulting specialise in helping bricks and mortar retailers integrate an online business successfully into their current structure, as well as we support pure players to optimise their offer and costs to become sustainably successful. If you would like to know more about e-commerce grocery retailing get in touch with Paul Foley at +43 1205 1160 1253 or pf@foleyretailconsulting.com.